Armstrong sees the Gold bull market lasting until roughly 2016 (17.2 years starting in 1999). 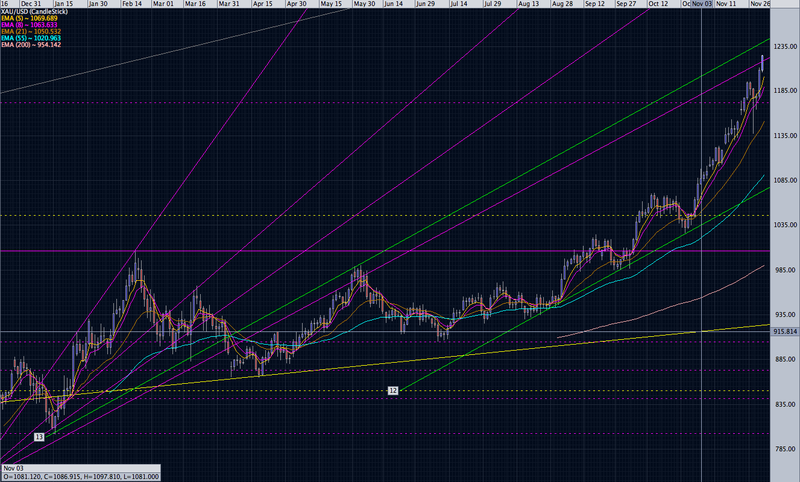 Is it at this point that you see the USDX bottoming at .5200? Is it at that point when you see the Federal Reserve Gold Certificate put in place? According to cyclical analysis it would come at the low point business wise of the 17.2 cycle. How long do you think this world monetary system will take to be implemented? I guess once again the US will lead the process. Do you think China (or India) will take a major role in it? Will it be done under the IMF umbrella? After the Federal Reserve Gold Certificate is in place, do you believe that the world´s economy can enjoy some period of stability (with the exception of geopolitical considerations)? I see the USDX bottoming between .4600 and .5200, yes. I have learned not to argue with Armstrong on cycle timing. Gold should have a temporary high point between January 14th and June 25th, 2011. Implementation is not a process, it is a surprise. The US will not necessarily lead the process. By then the IMF will be the Western World Central Bank, if not in name, certainly in function. China and India will play a major role by demand via back financial channels. It will likely be done under the IMF umbrella as part of a Super Sovereign Currency. After the Federal Reserve Gold Certificate is in place the world’s economy should be able to enjoy a period of stability for a considerable amount of time, but with a total rearrangement of positions of national economic powers moving towards Asia and do not forget Jakaya Kikwete and the common market of sub Sahara African countries of merit and leadership. They are there. As I write to you this evening, the very real prospect of hyper-inflation, a catastrophic currency event, is staring down the vast world of US dollar-denominated paper promissory notes. Gold is behaving like a bright comet in the sky, grabbing the attention of the keen observer and giving them an edge over others who are too distracted to look up. The confidence model is rapidly crumbling, after many years of neglect; the US dollar bubble is finally bursting in an awesome way. If there were genuine integrity, then surely such a model would do; but the lack of sufficient moral fortitude in the hearts of men, makes it virtually impossible to have a confidence based economy for very long; because the confidence is merely an illusion and the model can only be sustained as long as the illusion persists. On the daily chart, we see panic buying (and short covering) driving the price of gold to well above $1200 dollars. Major central banks, such as the Indian central bank, have become large-scale buyers of Gold. It looks like my original medium-term target of $1379 is going to be upon us relatively soon. Our next target may soon be followed by a touch of the inflation-adjusted high of $1650, followed by a period of consolidation. 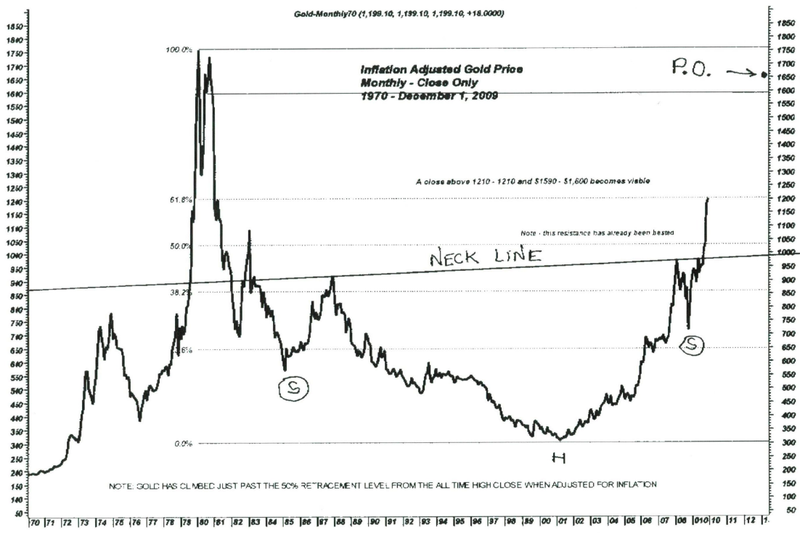 The picture becomes clearer if we look at the inflation-adjusted monthly chart, showing the gold price action clear back to 1970. Considering official inflation statistics, we can see that gold has yet to move past its previous high, despite a vast expansion in monetary aggregates, which has occurred during the past several decades. Nobody can say for sure what will happen with the short-term fluctuations. But longer-term it is quite clear that the price of gold will move into the $5,000 range, as the reality of the need for hard assets sets in. It doesn’t take but a few billion dollars worth of gold purchases to create a significant increase in the gold price. Given all of the trillions of dollars already in circulation and the trillions planned for bailouts; the target of $5,000 will likely turn out to be a conservative target, once the dust has all cleared.